Geopolitics Is Dead. Long Live Geoeconomics. 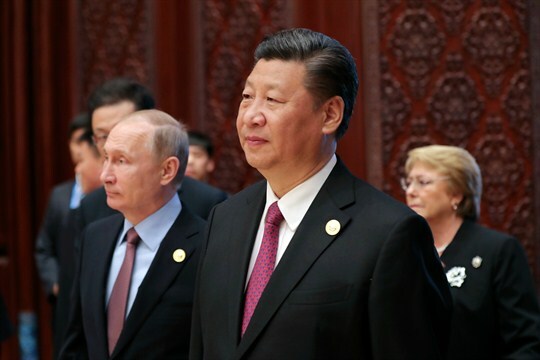 Russian President Vladimir Putin and Chinese President Xi Jinping attend the Belt and Road Forum, Beijing, May 15, 2017 (AP photo by Lintao Zhang). In this week’s Trend Lines podcast, WPR’s editor-in-chief, Judah Grunstein, senior editor, Frederick Deknatel, and associate editor, Omar H. Rahman, discuss Saudi King Salman’s landmark trip to Moscow and what the visit—the first by a Saudi monarch—says about Russia’s growing influence in the Middle East. For the Report, Salvatore Babones talks with Andrew Green about how geoeconomics is replacing geopolitics as the driver of international power politics, and why that is ultimately good for the United States. If you like what you hear on Trend Lines, as well as what you’ve seen on WPR, please think about supporting our work by subscribing. We’ve reached the second month of our subscription drive, and our goal for the coming week is to sign up 50 new subscribers. Paid subscriptions are our only source of income, which means we work for our subscribers, not for advertisers. We’re currently offering a 25 percent discount on the first year of an annual subscription to our podcast listeners. To take advantage of it, just enter the word “PODCAST” in the box marked “Coupon or referral code” on our subscription registration form. Is Russia the West’s Potential Partner, Rival, Adversary—or Even Enemy? Is Kenya’s Election Debacle a Failure of Technology or Governance?